The palace of the Sun was a radiant place, gleaming with gold and ivory and jewels. Well, actually, there were two of them -- one in the east and one in the west. Each day, as soon as Eos, goddess of the dawn, opened the palace gates, Helios would burst forth in his dazzling chariot to ride across the sky. His radiance lit up everything around him. 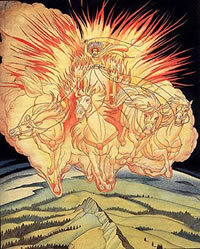 It took all of his great strength to control the four wild and fiery horses that carried him up the steep and narrow path to the top of the sky, but he kept them under control. At high noon, they would rest a bit and look around, seeing everything. Then they would continue on their way and the shadows would eventually grow long and dusk would be upon them as they arrived at the western palace. After a rest, Helios and his horses would set off by sea to the eastern palace, and get ready to make the trip all over again. 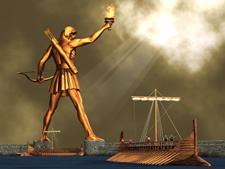 Rhodes built a gigantic statue in his honor to guard their harbor. Although nothing remains of it today, it is still known as the Seventh Wonder of the World. Apollo is sometimes referred to as the same god as Helios, but they were actually two different gods. Apollo was the son of Zeus and the twin sister of Artemis. He was the god of light and music. your universe. 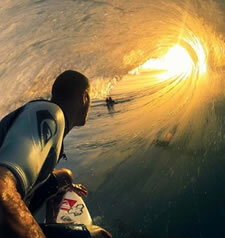 Like the Sun in the sky, everything else revolves around this center. Its traits are held deep within your psyche. You look out at the world from it. You know what you know because of it. 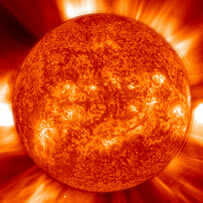 The Sun is your ego is therefore the most personal of all the Personal Planets. Its placement in your chart shows where you want to shine...to make a name for yourself. It's that "look Ma, no hands" urge we all have, however large or small. It is the need we have to step out and say "look at me - and tell me I'm great!" Without the Sun, there is no light and life as we know it on Earth would not exist. It lets us see that we are not alone. It brings joy and happiness to our world and to our life. It stirs the seedlings to reach for the sky. The placement of the Sun in your chart describes the focus of your ambitions and what it is you feel driven to achieve. The house it is in shows the interests that will be with you throughout your life. If it lies in one of the houses below the horizon, the focus will be quieter and more internal than it would be if it were above the horizon, where making a name for yourself can be seen by everyone around you. The traits of the sign the Sun is in at your birth describe how you go about attaining this name for yourself and how much energy your physical body has available to put into it. You don't give a thought to these behaviors, you just do them. They are what you feel comfortable with, the essence of what it means to be you. From our vantage point here on Earth, it appears as though the Sun is moving around us, but in the 1600's, Galileo and his telescope proved it to be the other way around. We now know that the Earth revolves around the Sun. In fact, we now know that the Sun is actually orbiting around the center of the galaxy! The Earth is 93 million miles away from the Sun and travels around it in a little over 365 days, which is the length of our earth-year. The orbit is slightly elliptical, not quite a perfect circle. It's path around the Sun defines a plane known as the ecliptic, which is an imaginary line in the sky along which the Sun appears to travel as the Earth goes around the Sun. It is this path that defines the signs of the zodiac. And because of the tilt of the Earth on its rotational axis, which does not change directions as the Earth progresses around the Sun, we experience the seasons associated with different times of the year.